John - Statesville, NC, USA The best air filter charge kit for K/N filters "This will charge a K/N Air filter with ease. 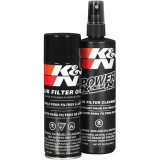 This charge kit is the one to use, definitely if you own a K/N filter. It’s easy to use simply spray on cleaner let soak & rinse with water then let dry. Once filter is dry spray oil evenly on filter until saturated." MrSir2u - Michigan, USA K&N kit "Easily clean and oil air filter so do it frequently."